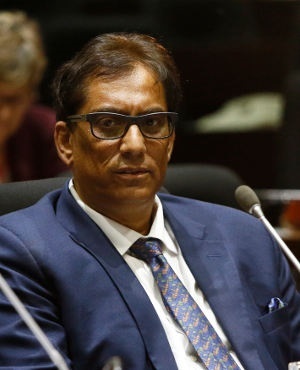 Iqbal Survé, Independent Media's chairperson, testified on Tuesday that the media group had only been making interest payments to a Chinese consortium and not to state-asset manager the Public Investment Corporation. Survé was testifying for a second day before the judicial commission of inquiry into the PIC. Independent Media, the owners of the Star, the Cape Times and I’solezwe lesiXhosa, among other titles, was bought by Sekunjalo Independent Media in 2013 from its former Irish owners. Survé told the commission that about R1bn of the deal was funded by a Chinese consortium called Interacom Investment Holdings, R850m came from the PIC and R150m from the Sekunjalo group. Independent Media now owes the state-run asset manager an outstanding balance of roundly R1.5bn, given the interest that has accrued on the initial investment. Interacom Investment Holdings, incorporated in Mauritious, comprises China International television Corporation and the China Africa Development Fund. Survé said that interest payment had only been made to the Chinese consortium. "Until recently the interest payment to the Chinese had to be made because that was the structure of the transaction. The PIC's risk was substantially reduced from the initial investment they were going to take, and they agreed that the [Chinese companies] would in fact get the interest". It was not clear from the testimony how much had been paid back to the Chinese consortium or whether anything further was owed. Survé said the sole entity currently funding Independent Media was Sekunjalo, the investment holding company which he heads. "If Sekunjalo decides tomorrow to stop funding Independent Media, the PIC suffers, as they are an equity holder." He gave a number of reasons for the media group's poor performance, including lack of advertising, long-term printing contracts it could not alter, declining circulation and competition by competitors. He said the financial position of the media group was giving him sleepless nights, adding that Independent Media was the most objective media group in South Africa and he never interfered with editors and journalists. He said that, given the poor financial position, he wanted to engage the Chinese consortium and the PIC to discuss a recapitalisation deal, but claimed the PIC had refused to engage with him. If a recapitalisation was not forthcoming, another option was to "retrench half the people," he said. "I really can't do that right now. I mean I find it difficult to do that because it is job losses and people's families," he said. "Maybe, I am not tough enough to do that kind of thing – maybe my colleagues will have to look at it."